First Ever 5.1 Surround Sound Version Mixed From Original Analog Master Tapes by James Guthrie! The Most Anticipated SACD Release Since The Dark Side Of The Moon! Easily The Biggest SACD Title In The Analogue Productions Catalog! Wish You Were Here is a multitrack masterpiece. Now, to have it mixed for 5.1 surround sound from the original analog master tapes by Pink Floyd's Producer/Engineer James Guthrie is very exciting. Is this the biggest SACD reissue in the history of the format? Time will tell, but don't bet against it. Wish You Were Here(?) Now you can be. Total lifelike recreation of a chart-topping, pioneering, way-ahead-of-its-time blockbuster. You talk about a title made for multichannel SACD! It's as if they knew 35 years ago that this format would be available. Finally, technology caught up with Pink Floyd. And oh how lucky we all are to still be around to hear this legendary studio recording in its full potential. This monumental SACD is released as a part of EMI's huge Why Pink Floyd...? 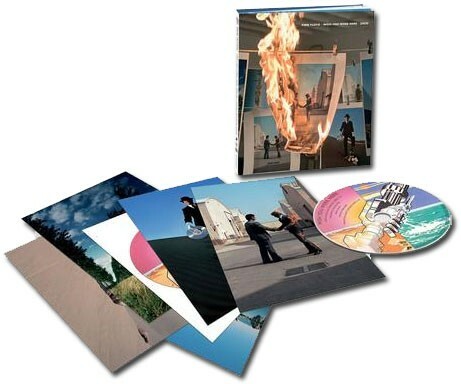 campaign that includes remastered CDs, Blue-rays, DVDs, LPs, memorabilia box sets and this, the first-ever multichannel presentation of Wish You Were Here. The SACD also of course includes a stunning stereo mix. And as this is a hybrid disc, the record is of course also playable on a standard CD player. On its release in 1975 Wish You Were Here topped the album charts in both the UK and the U.S. Reflecting the band's thoughts of the time on the music business and exploring themes of absence, Wish You Were Here contains the classic cut "Shine On You Crazy Diamond," a tribute to founding band member Syd Barrett. In fact, Barrett, who'd long been absent from the lives of Pink Floyd's band members, stopped by the Wish You Were Here recording sessions at London's Abbey Road Studios unannounced. The reunion - with Barrett reportedly appearing in poor mental condition - is said to have been an emotionally stirring event for the band, and apparently that encounter would be the last any of the band members were ever to see of Barrett, who died in 2006. As they did with their previous release, Dark Side of the Moon, Pink Floyd made great use of studio effects for this, their ninth album overall. The record's winding soundscapes are perfect for the canvas of multichannel SACD. Spacious and airy, the record breathes like a living being. Wish You Were Here was selected by Rolling Stone as No. 209 on their list of "The 500 Greatest Albums of All Time". And that's before they heard it like this! "Wow! This landmark disc beats out the earlier SACD of Pink Floyd’s Dark Side of the Moon. Rolling Stone rated the stereo version one of the 500 Greatest Albums of All Time, but in gorgeous 5.1-channel remastered surround made from the original quad master tapes by the Floyd’s Producer-Engineer James Guthrie, it becomes an unbelievable blockbuster. Pink Floyd pioneered the creative use of surround sound in their concert performances, but they didn’t get any of their quad mixes distributed on disc, DTS CD or tape as did The Moody Blues. Now technology has caught up with them and we can hear the entire amazing potential of this monumental album." - John Henry, www.audaud.com, 5 Stars!! Recorded at Abbey Road Studios January to July 1975.